Revisiting the In The Game brand, 2017 Leaf ITG Stickwork Hockey relies on a variety of themes, eras and, of course, stick relics, to provide a unique release. Collectors can count on four game-used memorabilia cards in every box. 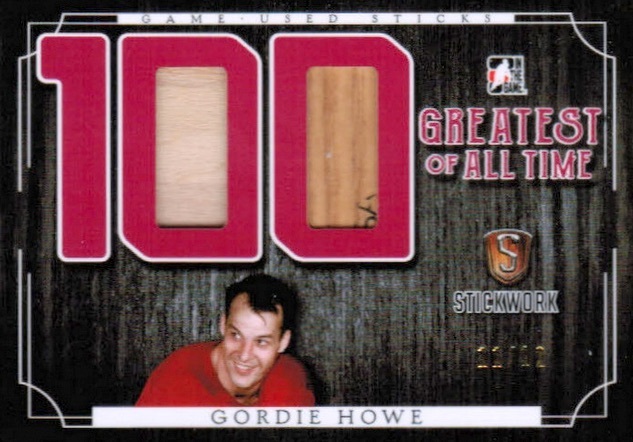 Unlikely to be a shock, 2017 Leaf ITG Stickwork Hockey strictly focuses on game-used stick cards. 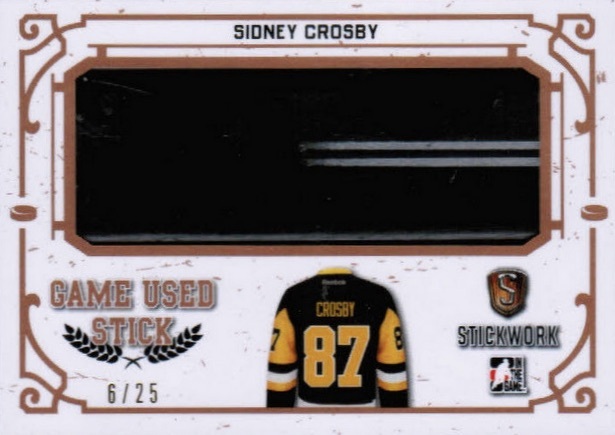 Adding in plenty of talent, single-player editions include 100 Greatest of All-Time inserts for hockey legends, Hall of Fame-based Enshrined Stick and Enshrined Goalie Stick, and Game-Used Stick and Game-Used Goalie Stick cards for current and former stars. 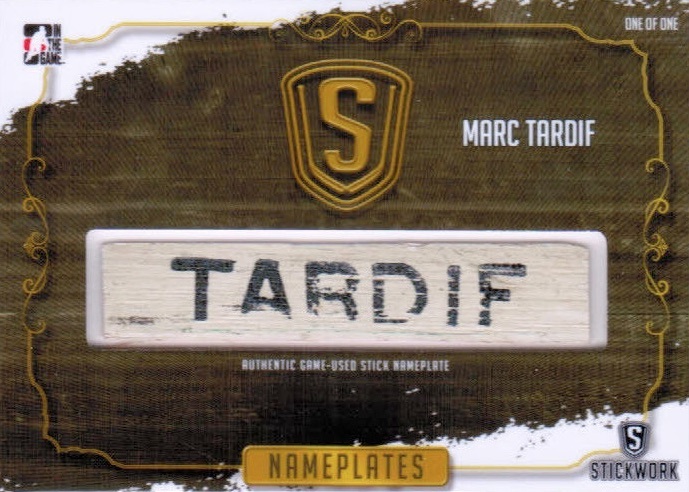 Other inserts to feature a single subject are the one-of-one Nameplates inserts and Lumbergraphs, which displays cut stick signatures. 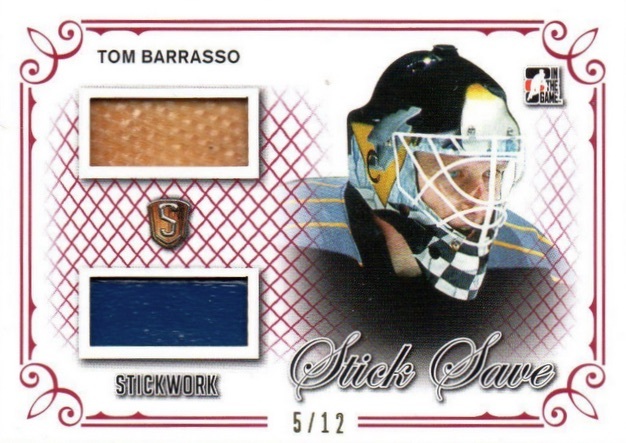 2017 Leaf ITG Stickwork Hockey also offers many multi-player relics. 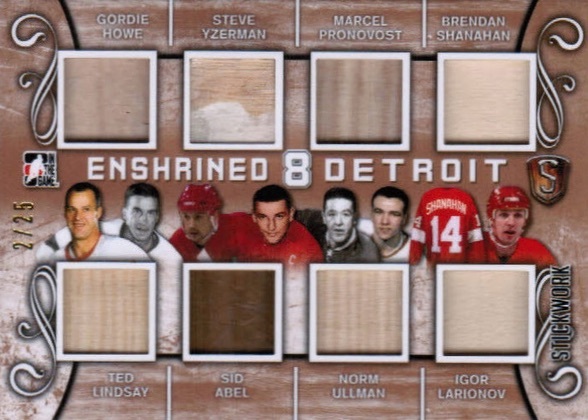 Among these are the Decade Leaders, Stick Rack 4, and Vintage Stick Rack 4 quad-player cards, and eight-person inserts via Award Season, Enshrined 8, Enshrined 8 Franchise and Tape to Twine, which showcases game-used stick tape. 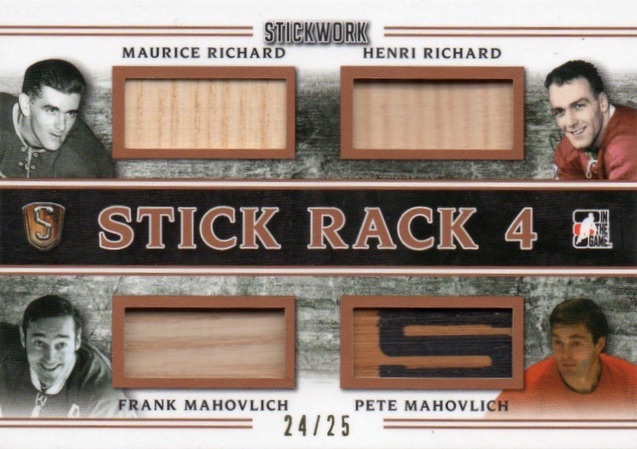 2017-18 LEAF STICKWORK HOCKEY STICK RACK FOUR Quad Relics #2 17 Beliveau LOOK! 70 cards. Shop on eBay. PARALLEL CARDS: Red #/12 or less, Platinum #/5 or #/3, Silver #/3 or #/2, Gold 1/1, Emerald* #/5 or less (Toronto Expo*). 12 cards. Serial numbered #/25. Shop on eBay. PARALLEL CARDS: Red #/12, Platinum #/5, Silver #/2, Gold 1/1, Emerald* #/4 or #/2 (Toronto Expo*). 5 cards. Serial numbered #/25. Shop on eBay. PARALLEL CARDS: Red #/12, Platinum #/5, Silver #/3, Gold 1/1, Emerald* #/4 (Toronto Expo*). 3 cards. Serial numbered #/25. Shop on eBay. PARALLEL CARDS: Red #/12, Platinum #/5, Silver #/3 or #/2, Gold 1/1, Emerald* #/3 or #/2 (Toronto Expo*). PARALLEL CARDS: Red #/12, Platinum #/5, Silver #/3, Gold 1/1, Emerald* #/3 (Toronto Expo*). PARALLEL CARDS: Red #/9 or less, Platinum #/4 or #/3, Silver #/2, Gold 1/1, Emerald* #/3 or less (Toronto Expo*). PARALLEL CARDS: Red #/7 (*Patrick Roy - #/9), Platinum #/4 or #/3, Silver #/2, Gold 1/1, Emerald* #/3 or less (Toronto Expo*). 27 cards. Shop on eBay. PARALLEL CARDS: Red #/7 or less, Platinum #/4 or #/3, Silver #/2, Gold 1/1, Emerald* #/2 or 1/1 (Toronto Expo*). PARALLEL CARDS: Red #/9 or less, Platinum #/4 (*Hextall - #/3), Silver #/2, Gold 1/1, Emerald* #/2 or less (Toronto Expo*). 31 cards. Serial numbered 1/1. Shop on eBay. 2 cards. Serial numbered #/5. Shop on eBay. 68 cards. Serial numbered 1/1. Shop on eBay. 8 cards. Serial numbered #/25. Shop on eBay. PARALLEL CARDS: Red #/12 or #/5, Platinum #/5 or #/3, Silver #/3, Gold 1/1, Emerald* #/4 (Toronto Expo*). PARALLEL CARDS: Red #/12, Platinum #/4, Silver #/2, Gold 1/1, Emerald* #/5 or less (Toronto Expo*). PARALLEL CARDS: Red #/7, Platinum #/4, Silver #/2, Gold 1/1, Emerald* #/3 (Toronto Expo*).